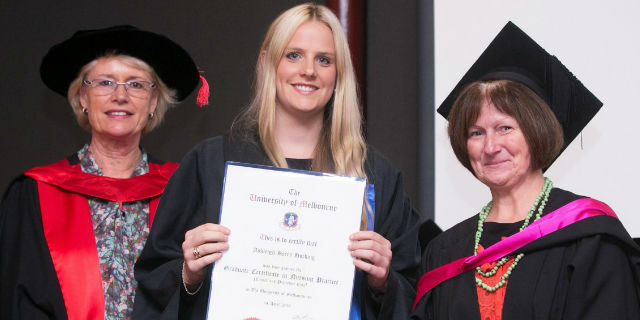 On 14 April, the School of Health Sciences held the first graduation and award ceremony for nursing students completing Graduate and Specialist Certificates in Nursing, Palliative Care and Transfusion at the University of Melbourne. From left to right: Head of School Professor Patterson with nursing graduate Ashleigh Hocking and Ms Cathie Pigott, School of Health Sciences. Image: Aria Photography. Hosted by the Head of the School Professor Elizabeth Patterson, the event was attended by students and award recipients, their families, donors, partner organisations and School staff. It is also important to acknowledge the commitment to undertake further study while meeting the continuing demands of career and home, and you are to be admired for taking on this challenge and succeeding. Ms Bernadette Twomey, the Executive Director of Nursing and Allied Health at Royal Children’s Hospital, gave the occasional address.Our congratulations go to the following students who were awarded prizes and scholarships on the night. Find out more information about studying nursing at the University at Melbourne at http://mdhs.unimelb.edu.au/nursing.